It’s the cream cheese in this recipe that works the magic. Well, that combined with the bacon. And the spinach, and the Italian cheese blend. I’ve used that on pizzas before, but never in a homemade macaroni and cheese. Cook the pasta, as directed on package, to al dente. Drain well. In a large saucepan, melt the butter and stir the flour in to make a paste. Pour in the milk, while whisking the sauce to prevent clumps. Let simmer for a few minutes to thicken, then stir in the cream cheese and shredded cheese and let melt into the sauce over low heat. 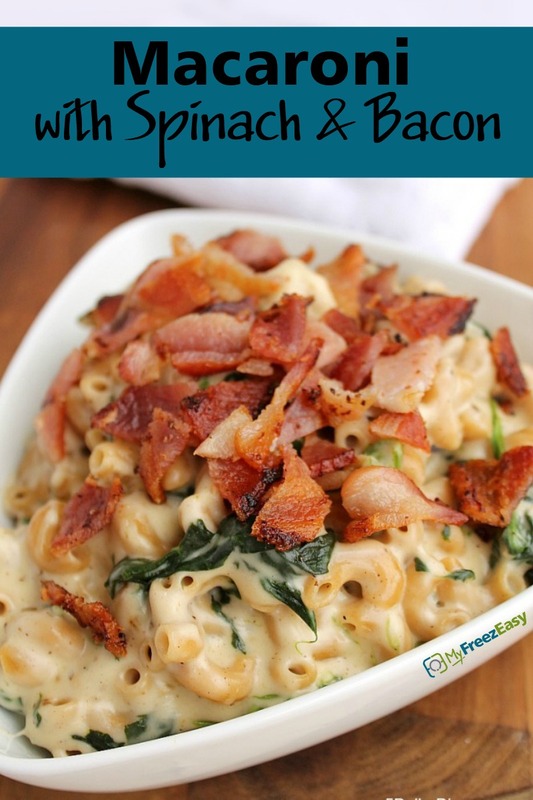 Toss the cooked pasta into the cheese sauce and coat completely, then stir in the frozen spinach. Pour into 9x13 inch baking dish. 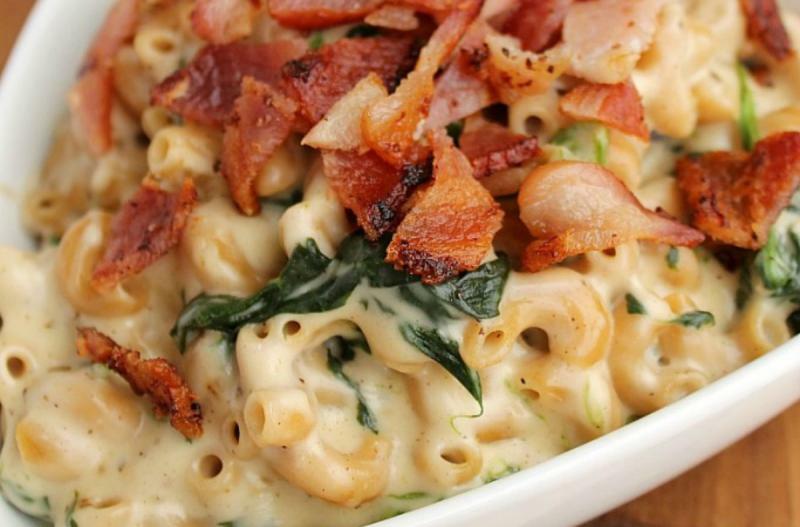 Serve Macaroni with Spinach and Bacon and side salad. In a large saucepan, melt 8 Tbsp butter and stir 8 Tbsp flour in to make a paste. Pour in the 3 cups milk, while whisking the sauce to prevent clumps. Let simmer for a few minutes to thicken, then stir in 2 - 8 oz. bars cream cheese and 4 cups shredded mozzarella cheese and let melt into the sauce over low heat. Gently combine in the tray. Put tray in the freezer and freeze up to 6 months in fridge freezer or 12 months in a deep freezer. Thaw in the fridge overnight, or a warm shallow dish of water for about 20 minutes, before transferring to the oven and baking as directed. Add crumbled bacon as garnish, before serving. Recipe is gluten-free if you use small shell gluten-free pasta. Thaw completely and bake at 350 F for 20 minutes. Add cooked, crumbled bacon as garnish.